Republican presidential candidate Donald Trump and his running mate Mike Pence are joined by their families on the stage as confetti and balloons fall at the end of the Republican National Convention on July 21, 2016 at Quicken Loans Arena in Cleveland. Balloons fall as Republican presidential candidate Donald Trump is joined by his family onstage after finishing his address on the final day of the 2016 Republican National Convention at Quicken Loans Arena in Cleveland, July 21, 2016. Republican presidential nominee Donald Trump and Vice Presidential nominee Mike Pence stand on the stage together as balloons drop on the final day of the 2016 Republican National Convention in Cleveland, July 21, 2016. 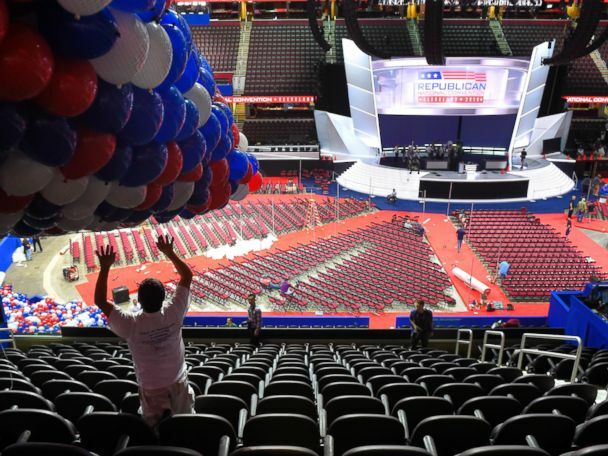 Delegates cheer as confetti and balloons fall at the end of the Republican National Convention on July 21, 2016 at the Quicken Loans Arena in Cleveland. Republican presidential candidate Donald Trump gives two thumbs up to the crowd during on the fourth night of the Republican National Convention on July 21, 2016 in Cleveland. Delegates cheer as Republican presidential candidate Donald Trump delivers his speech on the final day of the Republican National Convention, July 21, 2016 at the Quicken Loans Arena in Cleveland. A Code Pink protester is removed while Republican presidential candidate Donald Trump speaks on the last night of the Republican National Convention on July 21, 2016, in Cleveland. Republican presidential candidate Donald Trump delivers a speech after accepting the nomination on the fourth day of the Republican National Convention on July 21, 2016 in Cleveland. Ivanka Trump, daughter of Republican presidential candidate Donald J. Trump, waves as she walks off stage after introducing her father during the final day of the Republican National Convention in Cleveland, July 21, 2016. Ivanka Trump, daughter of Republican presidential candidate Donald J. Trump, speaks during the final day of the Republican National Convention in Cleveland, July 21, 2016. Barron Trump bump fists in front of Melania Trump with Donald Trump Jr. during the final day of the 2016 Republican National Convention in Cleveland, July 2016. Patrick O'Daniel from Austin, Texas, center, and his fellow Texas delegates wave their hats during the final day of the Republican National Convention in Cleveland, July 21, 2016. Pastor Mark Byrne speaks at the Republican National Convention in Cleveland, July 21, 2016. Heavenly Joy sings at the start of the fourth day of the Republican National Convention, July 21, 2016, at the Quicken Loans Arena in Cleveland. Maricopa County Sheriff Joe Arpaio is surrounded by members of the media and fellow Arizona delegates during the roll call at the Republican National Convention in Cleveland, July 19, 2016. A delegate poses with another dressed as Democratic presidential candidate Hillary Clinton on July 21, 2016, before the start of the last day of the Republican National Convention in Cleveland. Delegates dressed as Donald Trump and a soldier from the American Revolution, take a photo at the Republican National Convention in Cleveland, July 21, 2016. Former Speaker of the House Newt Gingrich, right, along with his wife Callista Gingrich, left, speak with delegates and attendees on the fourth day of the Republican National Convention on July 21, 2016 in Cleveland. Republican presidential candidate Donald Trump gives a thumbs to his running mate Mike Pence on the third day of the Republican National Convention on July 20, 2016 in Cleveland. Republican vice presidential nominee Gov. Mike Pence speaks during the third day of the Republican National Convention in Cleveland, July 20, 2016. Republican Vice Presidential candidate Mike Pence acknowledges the crowd as he walks on stage to deliver a speech on the third day of the Republican National Convention on July 20, 2016 in Cleveland. Delegates and attendees acknowledge Karen Pence, wife of Republican Vice Presidential candidate Mike Pence, on the third day of the Republican National Convention, July 20, 2016 in Cleveland. New Jersey Gov. Chris Christie takes a photo with delegates on the third day of the Republican National Convention, July 20, 2016, at the Quicken Loans Arena in Cleveland. Eric Trump speaks about his father, presumptive Republican presidential nominee Donald Trump at the Republican National Convention in Cleveland, July 20, 2016. From left, Donald Trump Jr., Donald Trump, Ivanka Trump and Tiffany Trump watch from the seats at Quicken Loans Arena on the third day of the Republican National Convention, July 20, 2016, in Cleveland. Sen. Ted Cruz flashes a thumbs up as he leaves the stage during the third day of the Republican National Convention in Cleveland, July 20, 2016. Senator Marco Rubio appears live via satellite on screen at the Republican National Convention in Cleveland, July 20, 2016. Delegates hold up signs on the third day of the Republican National Convention, July 20, 2016 in Cleveland. Wisconsin Governor Scott Walker speaks during the third day of the 2016 Republican National Convention in Cleveland, July 20, 2016. A delegates holds a sign that reads "Make America First Again" during the third day of the Republican National Convention on July 20, 2016 at the Quicken Loans Arena in Cleveland. Political talk radio host Laura Ingraham delivers a speech on the third day of the Republican National Convention on July 20, 2016 in Cleveland, Ohio. Delegates cheer at the start of the third day of the Republican National Convention in Cleveland, July 20, 2016. Florida Governor Rick Scott speaks on the third day of the Republican National Convention in Cleveland, Ohio, on July 20, 2016. Abby Paskvan sings the National anthem on the third day of the Republican National Convention, July 20, 2016, at the Quicken Loans Arena in Cleveland, Ohio. Delegates dance before the start of the third day of the Republican National Convention, July 20, 2016, at the Quicken Loans Arena in Cleveland, Ohio. Phyllis Schlafly, president of the Eagle Forum, arrives for the second day of the Republican National Convention, July 19, 2016 in Cleveland. A well-known conservative, Schlafly launched a successful campaign against the ratification of the Equal Rights Amendment to the U.S. Constitution in the 1970s. Rev. Glenn Clary of Anchorage Baptist Temple in Anchorage, Alaska, kneels down to pray in front of the stage before the third day session of the Republican National Convention in Cleveland, July 20, 2016. Donald Trump Jr. speaks about his father during the second day of the Republican National Convention in Cleveland, July 19, 2016. Presumptive Republican vice presidential nominee Mike Pence takes a selfie with a delegate on the second day of the 2016 Republican National Convention in Cleveland, July 19, 2016. Tiffany Trump, daughter of Republican presidential nominee Donald Trump, walks to the podium to speak during the second day of the Republican National Convention in Cleveland, July 19, 2016. New Jersey Gov. Chris Christie delivers a speech on the second day of the Republican National Convention on July 19, 2016 in Cleveland. Delegates yell "guilty" during New Jersey Gov. Chris Christie's speech on the second night of the Republican National Convention, July 19, 2016 in Cleveland, Ohio. Donald Trump delivers an address via video to delegates on the second night of the 2016 Republican National Convention in Cleveland, July 19, 2016. Senate Majority Leader Mitch McConnell speaks after roll call on the second day of the Republican National Convention on July 19, 2016 in Cleveland. Delegates celebrate after Speaker of the House Paul Ryan announces the official nomination of Republican presidential candidate Donald Trump on the second day of the Republican National Convention on July 19, 2016 in Cleveland, Ohio. RNC officials directly poll delegates for votes after Alaska contested the recording of the roll call of states for the nomination of Donald Trump on the second night of the 2016 Republican National Convention in Cleveland, July 19, 2016. Speaker Paul Ryan waits for a recount of Alaska's votes during the second night of the Republican National Convention in Cleveland, July 19, 2016. Left to right, Donald Trump Jr., Ivanka Trump, Eric Trump and Tiffany Trump, participate in the roll call for the state of New York. 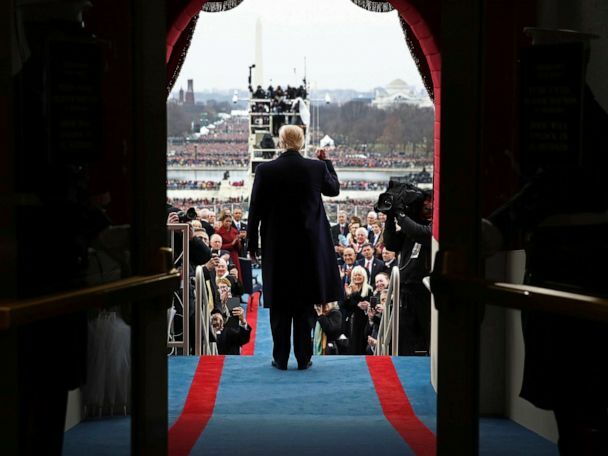 The state's votes put Donald Trump over the threshold to clinch the nomination on the second night of the Republican National Convention on July 19, 2016. Donald Trump Jr. stands with his siblings as he announces New York's votes officially putting Donald Trump over the top during the roll call of states on the second day of the 2016 Republican National Convention in Cleveland, July 19, 2016. Delegates cheer during roll call on the second day of the Republican National Convention, July 19, 2016 at the Quicken Loans Arena in Cleveland, Ohio. Speaker Paul Ryan addresses the delegates during the second day of the Republican National Convention in Cleveland, July 19, 2016. Minnesota delegate Mary Susan walks down the hallway in her Trump cape at Quicken Loans Arena before the start of the second day session of the Republican National Convention in Cleveland, July 19, 2016. Harmeet Dhillon of San Francisco covers her head before delivering the invocation-A Sikh prayer- during the second night of the Republican National Convention in Cleveland, July 19, 2016. Donald Trump Jr. is interviewed prior to the start of the second day of the Republican National Convention on July 19, 2016 at the Quicken Loans Arena in Cleveland, Ohio. Melania Trump, wife of Republican presidential candidate Donald Trump walks to the stage during the opening day of the Republican National Convention in Cleveland, Ohio, July 18, 2016. Presumptive Republican presidential nominee Donald Trump introduces his wife Melania on the first day of the Republican National Convention on July 18, 2016, at the Quicken Loans Arena in Cleveland, Ohio. Republican presidential candidate Donald Trump steps to the podium to introduce his wife Melania during the opening night of the Republican National Convention in Cleveland, Ohio, July 18, 2016. Former New York City Mayor Rudy Giuliani delivers a speech on the first day of the Republican National Convention on July 18, 2016 in Cleveland, Ohio. Senator Joni Ernst delivers a speech on the first night of the Republican National Convention on July 18, 2016 in Cleveland, Ohio. Presumptive Republican vice presidential candidate, Indiana Gov. Mike Pence talks with Utah Senator Orrin Hatch, right, during the first day of the 2016 Republican National Convention in Cleveland, Ohio, July 18, 2016. Milwaukee County Sheriff David Clarke salutes at the Republican National Convention in Cleveland, Ohio, July 18, 2016. New Jersey Gov. Chris Christie attends the first day of the Republican National Convention along with his son, Andrew Christie, on July 18, 2016 in Cleveland, Ohio. A member of the activist group Code Pink demonstrates during Sen. Jeff Sessions speech on the first day of the Republican National Convention on July 18, 2016 in Cleveland, Ohio. A delegate becomes emotional while listening to Pat Smith speak about losing her son in the Benghazi attack during the evening session on the first day of the 2016 Republican National Convention in Cleveland, Ohio, July 28, 2016. Former Navy SEAL Marcus Luttrell speaks during the evening session of the first day of the 2016 Republican National Convention in Cleveland, Ohio, July 18, 2016. A delegate wearing a hat with lights listens to speakers during the evening session at Republican National Convention at the Quicken Loans arena in Cleveland, Ohio on July 18, 2016. Television personality and CEO of Duck Commander, Willie Robertson speaks on the first night of the Republican National Convention, July 18, 2016 in Cleveland, Ohio. Scott Baio gives a thumbs while delivering his speech on the first day of the Republican National Convention on July 18, 2016 at the Quicken Loans Arena in Cleveland, Ohio. Marlana VanHoose performs the U.S. National Anthem during the Republican National Convention on July 18, 2016 at Quicken Loans Arena in Cleveland, Ohio. Former Republican presidential candidate Sen. Bob Dole greets people before the evening session of the opening day of the Republican National Convention in Cleveland, Ohio, July 18, 2016. Republican National Convention delegates yell as the chair announces that the rejection of efforts by anti-Trump forces in Cleveland, Ohio, July 18, 2016. People cheer as delegates gather on the floor during first day of the Republican National Convention in Cleveland, Ohio, July 18, 2016. Corey Lewandowski, former campaign manager for Donald Trump, surveys the floor of the Republican National Convention on July 18, 2016 at the Quicken Loans Arena in Cleveland, Ohio. Florida delegates Pam McAloon, left, and Tina Harris dance during first day of the Republican National Convention in Cleveland, Monday, July 18, 2016. Guam delegates on the first day of the Republican National Convention on July 18, 2016 at the Quicken Loans Arena in Cleveland, Ohio. 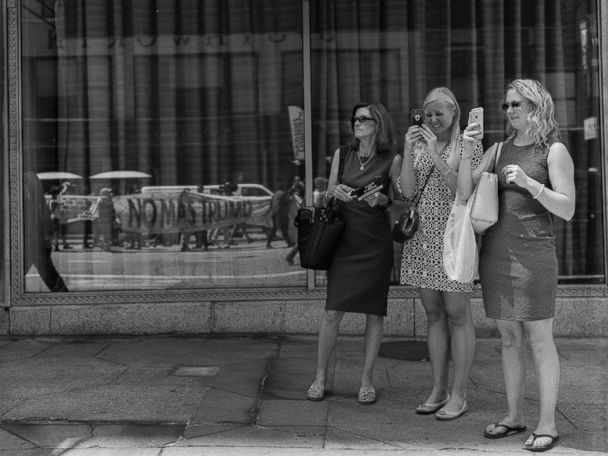 Photographs in and around Cleveland before and during the 2016 Republican National Convention.